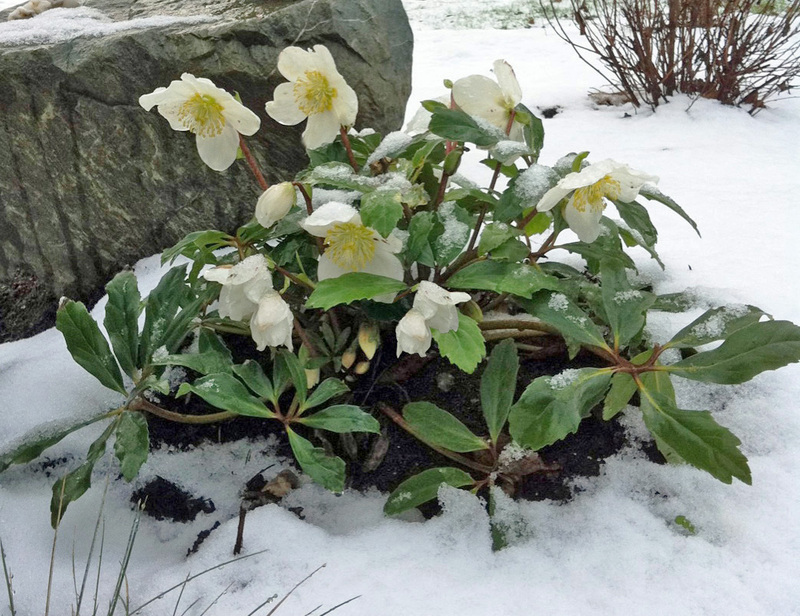 It almost comes as a surprise each year when the hellebores raise their hopeful heads in deep winter or early spring. Their evergreen, toothed, leathery leaves stay green most of the year then may be cut off just before the next bloom time – for some varieties that’s as early as November. 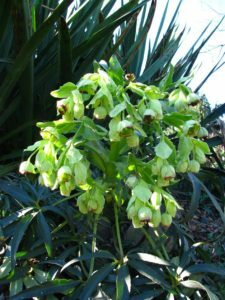 The long-blooming hellebore is among the most fashionable and collectible perennials for partially shaded areas and one of our specialties. We stock a wide variety of these woodland beauties, which also happen to be deer resistant! 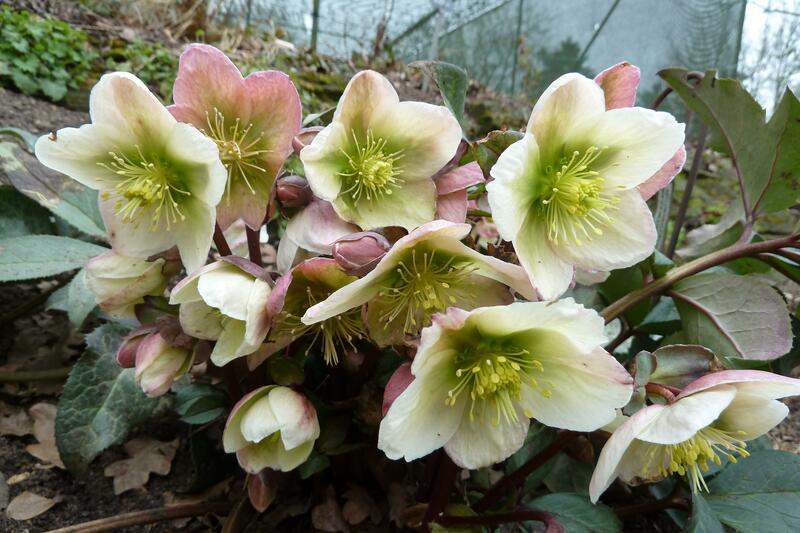 The most commonly grown hellebores in our region include the Christmas Rose, Lenten Rose and Stinking Hellebore. 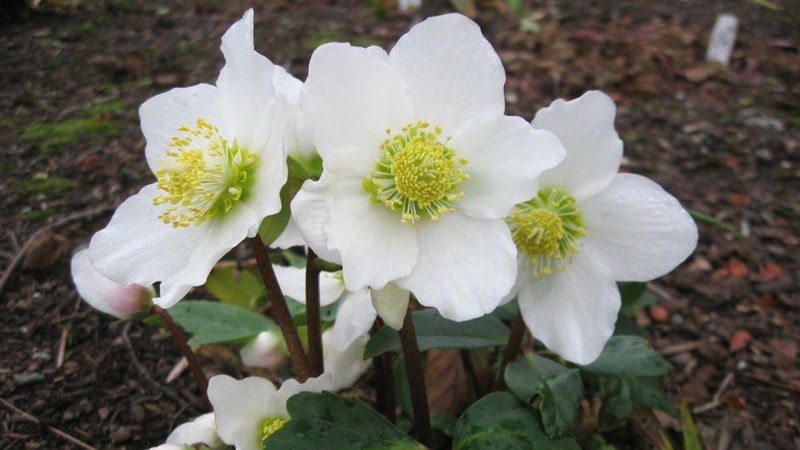 Helleborus orientalis or Lenten Rose is a clump-forming evergreen that grows to about 24 inches tall and wide. Its nodding, saucer-shaped flowers can be seen in white, green, pink, rose to purple to almost black, sometimes speckled or showing up with single, double or triple flowers. 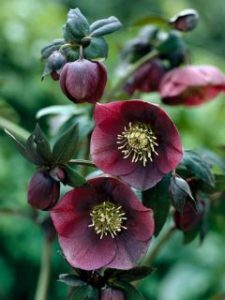 The hellebore provides contrast in almost any companion planting. After ushering in the blooms of daffodils and tulips, hellebore’s sturdy foliage remains to camouflage the dying foliage of the bulbs. The Christmas Rose, Helleborus niger, has been a cottage garden favorite for centuries. White bowl-shaped flowers, usually with green eyes, appear midwinter, often right from the snow. The Christmas rose grows about a foot tall and wide. Despite its name, stinking hellebore (H. foetidus) doesn’t stink unless you crush its leaves. However, as this plant has been used medicinally down through the years, one can see how the name might have come up. Several varieties actually have fragrant blooms. The pendent flowers of H. foetidus belong in a class all their own; they almost don’t look like flowers. The muted yellow-green blooms may have purple margins, with leafy, pale green bracts emerging where the flower stalks branch. It can get 1-3 feet tall and as wide over time.